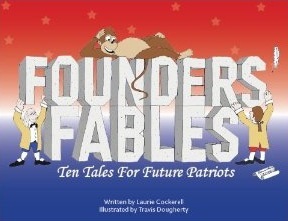 "Founders' Fables" is a colorful, conservative children's book (not many of those, are there?). Ten stories, written in rhyme and in fable form, help explain principles of the Founding Fathers. Issues such as the national debt, eminent domain, the importance of limited government, self-reliance and more are easily understood through these fables by children 5 years and up. The stories are accompanied by colorful, whimsical illustrations and are followed by age appropriate discussion questions and a short art activity. This book is listed on Constituting America and the NFRW Mamie Eisenhower Library Project Recommended Book Lists.